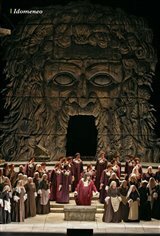 Mozart's first operatic masterpiece, Idomeneo will be shown in select cinemas nationwide on Saturday, March 25. James Levine conducts this rare Met revival, set in the aftermath of the Trojan War. Jean-Pierre Ponnelle's classic production, which has its first Met revival in over a decade this season, stars Matthew Polenzani in the title role. The cast also includes Elza van den Heever as Elettra, Nadine Sierra as Ilia, Alice Coote as Idamante, and Alan Opie as Arbace. Sung in Italian with Met titles in English, German, Italian and Spanish. Encore performances in select theaters on May 6, 8, and 10, 2017.